Hair loss in cattle can result from genetics, diseases, parasite infestation and poor husbandry. Formally known as alopecia, this hair loss ranges from mild to severe. It can be a side issue of a far more serious -- even life-threatening -- condition. Until you have a diagnosis, isolate any animals experiencing hair loss. A genetic condition that causes some specimens to grow less-than-normal amounts of hair, hypotrichosis occurs in numerous dairy and beef cattle breeds. It usually affects the entire hair coat; parts of the coat may be bald. Affected breeds include the Angus, Hereford, Guernsey, Jersey and Simmental. Crossbred cattle can also inherit this sparse coat. Usually, cattle with hypotrichosis have other issues, including lack of horn development, odd coat coloring, dental defects, abnormally large tongues and underdeveloped organs. A rare genetic condition, alopecia anemia is found in polled Hereford calves. These calves not only suffer from anemia, or lack of sufficient red blood cells, but also experience hair loss. Hair loss starts around the ears and muzzle but progresses all over the body. Other symptoms include skin thickening, with dermatitis in the affected area. While cattle are prone to various types of mite infestation, most bovine mites cause lesions, rather than hair loss, in affected animals. Among the exceptions are the scabies mite, which cause lesions, itching and alopecia. Without prompt treatment, the skin thickens and the lesions become crusty; secondary bacterial infections are likely. Treatment consists of quarantining infested cattle and applying an approved dip or spray miticide, along with an injection of the dewormer ivermectin. Prevention is always better than treatment. Keep any new cattle away from the established herd for several weeks, contacting a vet if any of the animals show symptoms of mite infestation. Chewing or sucking lice can infest cattle, but a single bovine specimen generally requires a severe infestation -- over a million of these miniscule parasites -- before developing symptoms. Signs of lice infestation in cattle include hair loss, itching and scaly skin. Lice can transmit disease, including bovine dermatomycosis and bovine anaplasmosis. Treatment consists of applying the appropriate insecticide and quarantining affected animals. Prevent a major louse outbreak by feeding your herd a high-energy diet and avoiding overcrowding. 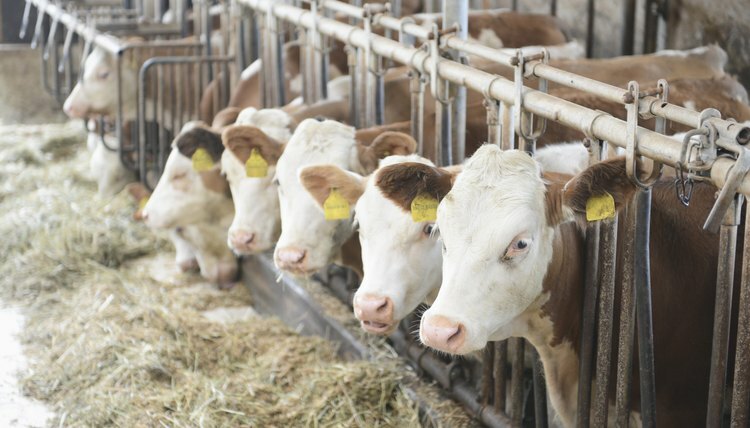 Alopecia appears as a secondary symptom in various bovine bacterial and viral diseases. While salmonellosis might cause alopecia on the lower legs of sick cattle, the more obvious symptom is severe, life-threatening diarrhea. Other intestinal diseases can cause hair loss, especially in calves, but the primary concern is saving the animal from severe scouring, or diarrhea.